Here is the circuit diagram of superb mini audio power amplifier, That can be power with 4.5 volt dc to 18 volts dc (maximum). This amplifier is based on TDA1015, Product of NXP Semiconductors formerly PHILIPS Semiconductors. The TDA1015 is a monolithic integrated audio amplifier circuit in a 9-lead single in-line (SIL) plastic package. The device is especially designed for portable radio and recorder applications and delivers up to 4 watt in a 4 ohm load impedance. 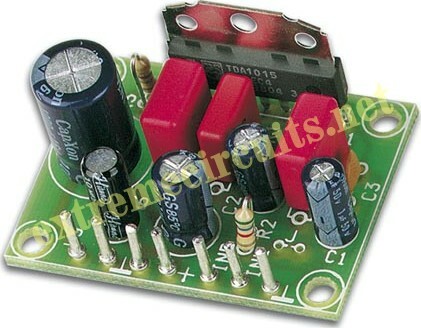 The very low applicable supply voltage of 3,6 V permits 6 V applications.